In January, my garden is in a muddle. At least 17 different plant types are flowering: leftovers from last year, like Fuchsia, Abutilon and Hederantha, genuine winter flowerers like Helleborus, Rhododendron ‘Christmas Cheer’, Iris unguiculata, winter jasmine and witchhazel, and Pulmonaria and primroses that think it is spring! It is difficult to predict how things will develop from now. It may depend on whether we get another ‘Beast from the East’. With any luck, we should be enjoying daffodils and crocuses and noticeably longer days. 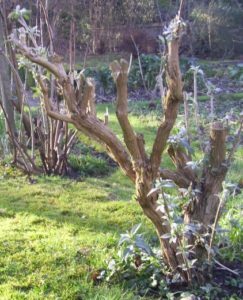 Some plants that flower on new season’s growth, like late-flowering clematis and Buddleja, need to be stimulated by pruning back to a framework now. Prune late-flowering clematis to just above a low pair of healthy buds 6-12” (15- 30cm) above soil level. Finish pruning rambling and climbing roses and start pruning bush roses at the end of the month. Prune autumn fruiting raspberriy canes to ground level. 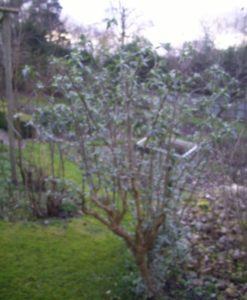 Prune hazel, once catkins have shed their pollen – use the prunings as pea sticks or make them into woven plant supports. Sow (under glass) vegetable seeds like cabbages, leeks, broad beans and lettuce. Aubergines, peppers, chillies and tomatoes can be sown, but need heat to germinate. Chit potatoes in a light cool place. Place the seed potatoes, eye end up, in trays or egg boxes to plant out in April. 9th February is when the Church Crookham Garden Society trading shed opened again for members. Details on the website. The January advice can be found on the website as well. 22nd February Church Crookham Garden Society AGM, supper and quiz at 7.30pm, Willis Hall. Guests welcome £3, members free.